In an effort to bring Asia and Europe closer, to know better the cultural, artistic and creative opportunities of exchange between the two continents, it is necessary to create a stable platform and network where to share information and experiences. Open and fluid knowledge begins with better information related to those cultural agents in Europe and Asia who focus their activities on internationalisation, exchange and networking issues. In order to share forces and objectives, to enhance intercultural and international creativity and to develop both a local and a global vision and understanding, it becomes increasingly important to get to know the international projects that already exist as well as to investigate and to imagine new ideas, visions and experiences for the future. Recently I had the opportunity to meet with Luckana Kunavichayanont – whom I warmly thank for this interview - Director of the vast and remarkable BACC (Bangkok Art and Culture Centre), the key hub for contemporary culture and art in Bangkok, Thailand. This interview – focused on issues like mobility, exchange, networking and internationalisation strategies - responds to the need to feed the Platform of Asian and European Cultural Mobility Funders. This initiative was organized by Arts and Theatre Institute (Czech Republic), Kelola Foundation (Indonesia), and On The Move (Belgium); and funded by the Asia-Europe Foundation (ASEF) and its partners Arts Network Asia (ANA) and the European network Trans Europe Halles (TEH), through the Programme Creative Encounters: Cultural Partnerships between Asia and Europe. Herman Bashiron Mendolicchio: Could you please introduce the “Bangkok Art and Culture Centre” and tell me which are its main aims and activities? Luckana Kunavichayanont: Bangkok Art and Culture Centre (BACC) is located in the heart of shopping and business district of Bangkok, right at the conjunction of Pathumwan intersection, conveniently reached by sky train, buses and other public transports. It is set up and mainly funded by Bangkok Metropolitan Administration and ran under the management of Bangkok Art and Culture Centre Foundation. 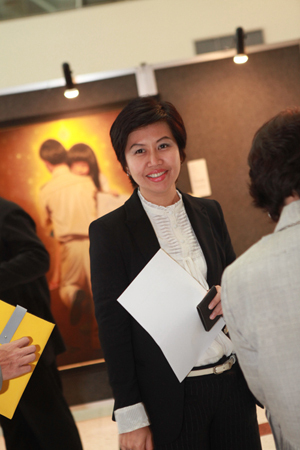 BACC is set up to serve as a place for the promotion and better understanding of Thai contemporary art and culture among the general local residents and international visitors with some international programme of exhibitions, music, flims, dances and performing arts showcased occasionally. It is also aimed at a recreational place for people to meet, to be relax, inspired, educated and to help define and make our contemporary culture. The history of the inception and campaign for BACC has rooted back for more than a decade of which could be too long to discuss here. You can find more info at this link: BACC Background. BACC is a ninth storey building with three top floor, 7-8-9 Fl. providing main exhibition space for BACC’s curated art exhibitions on Thai contemporary art with some open call and international travelling exhibitions. The sixth floor is office. The fifth floor houses auditorium room for cinema, mini concerts, theatre and other art and cultural related functions organized by BACC and other art and cultural partners both locally and internationally. There are meeting rooms on this floor. BACC also accommodates ArtHUB, a rental retail space for art and cultural related shops from the 1st to 4th floor. They are ranging from restaurants and cafés, book and souvenir shops, educational service shops like the National Film Archive, Thai Art Archive, Fashion Forum, Music Library, The Royal Photographic Society of Thailand, etc. We also have art library at the lower ground floor. HBM: Do you have any specific programme related with artistic and cultural mobility? LK: We have recently (from last year) initiated an art award together with Han Nefkens Foundation based in the Netherlands to help fostering the recognition of young Asian artist in the international world through a programme titled Han Nefkens Foundation and BACC Award. Also in order to establish networks between different Asian countries and to focus on contemporary art “made in Asia” today, a group of 10 local scouts from around Asia will draw up a first list of thirty candidates. It focuses on artists under the age of 40 of any nationality (but living in Asia) or gender that have established a solid trajectory but have not yet been given recognition by art institutions. The prize will be awarded every two years. For more info see: Han Nefkens Foundation - BACC Award for Contemporary Art in Asia. HBM: What kind of cultural mobility projects do you develop and/or fund? HBM: Why do you think mobility and exchange is important for artists and cultural operators? LK: Mobility and exchange is very important for artists and cultural operators. For artists, cultural mobility enhances their creative development via exposure to different art and cultural diversity. It offers knowledge gain and openness as much as better understanding and tolerance to cultural differences. Likewise, it offers cultural operators opportunities to expand their professionalism through the learning of diverse cultural operating concepts and models as well as networking. HBM: What do you think about the relationship between mobility and education? LK: Mobility can serve as another alternative way of education. It is more like a self-educating process. Modern schools in Thailand now integrate art and cultural tours in their normal teaching calendar as some knowledges and experiences have only come from ground or field studies through dialogues and observations with real practitioners in each particular fields. To get first hand experience is a significant learning process. With art, it is much different to see the works in slide presentation from the ones hanging in the museums. Mobility offers first hand experiences and stimulations for quest and discoveries. HBM: Which is your internationalisation strategy? What kind of partnerships, networks and international collaborations are you currently developing? LK: We have slowly developed our partnership with international organizations. We have worked with different international organizations ranging from museums, collectors, cultural agents, embassies and individual in our variety of programmes. For example, for our upcoming Bangkok ASEAN Art and Culture Festival (BAAF) which comprises of two major curated exhibitions focusing on Southeast Asia, we will have to get loans from several public museums as well as private collectors in Asia (see further: Bangkok ASEAN Art & Culture Festival) as well as talks, seminar, cinema and theatrical programmes that we have to gain co-operations from various cultural organizations like universities, embassies as well as international film clubs and companies. This year we focus on developing cultural partnership with organizations working in or related to Southeast Asia as part of the national approach towards becoming ASEAN Community which we see the Economic Community (ASEAN Economic Community –AEC) coming to light in 2015 among the three polars of ASEAN Community agreement. We are working on raising awareness of the other significant component of this unity, of becoming one ASCC – ASEAN Socio-Cultural Community. HBM: Talking about obstacles in mobility, what is your policy in relation to Visa issues? Do you have any plan in order to improve the visa procedures for artists and cultural operators? LK: So far we have very little problems concerning visa issues as Thailand is quite open for foreign visitors. We have obstacles bringing in artworks from overseas due to high duty restrictions for luxury goods (art pieces are considered and classified under the category of luxury items even though we declare its sole purpose for exhibition only). In this case, we normally work very close with foreign Embassies in Thailand to get exempt for duty or any deposits in bringing in art works or art objects. HBM: What is your vision for the future? LK: Our vision except from serving as agent for the catalyst of art and cultural understanding and its value to contemporary life and society, it is also our hope to connect people locally and cross-nationalities to disperse our cultural richness and to become part of the global communities amidst these fast growing and influx of information and technologies that human interconnection seems to be less addressed and present.